With uninterrupted Mt Yotei views, spaciousness and attention to detail a relaxing stay in this fully self catering property is ensured. There's even a hi-tech massage chair to ease tired muscles after a day enjoying Niseko's activities. This one bedroom cosy cottage offers an ideal retreat any time of year. Osteria is located in the quiet, scenic area known as Stage Izumikyo with the shuttle services to both Hanazono ski area and Hirafu village and ski lifts just a minute's walk away. Also within easy walking distance some of Hirafu's more popular cafes and restaurants can be enjoyed. 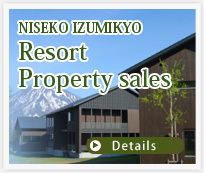 Ideal for a romantic get away offering privacy and a quiet location to fully enjoy a Niseko vacation. Please inquire about long stay options. Air conditioning, off street parking, high speed internet.